Description: On the Main at Baileys Wye. Kodachrome by C. Hash. 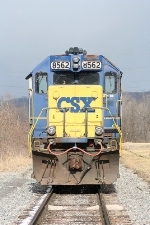 Description: CSXT 8562 is seen at Cumberland, MD. Unit is ex C&O 8562. Description: CSXT 8562, UP 5516, CSXT 8597 & 8584 are seen on a WB at Cumberland, MD. Description: CSXT Southbound Intermodal Train rumbles through Oglethorpe, Ga. Description: All EMD power for CSX #Q214, a N/B CSX autorack. Description: CSX 4836 is on the point of K-277 at Ridgefield Park, NJ 8/26/2006. Title: GCFX 3080 Leads Q631 Southbound through Atmore - First train of the day. Description: While I was waiting at Turret Steel at Pulaski and 74th Ave to get loaded. Description: CSX 8562 leads train Q494 northbound past the old signals at Lane, S.C. Description: CSX Q327-07 heads west across the GTW diamonds at Trowbridge. Description: Q327-07 heads west (technically north) at 12 Mile. Description: Q248-27 rolls on the heels of Q348-27 at MP-216 on the CSX Indianapolis Line. Description: 8562 holds the north bound track while 712 running lite zooms on by. Description: 8562 holds the north bound track waiting for a meet at Folkston, GA.